NEW YORK—Last month, NYU’s Jonathan M. Tisch Center of Hospitality held the 24th annual Stephen W. Brener Distinguished Lecturer Series in Hospitality Management. 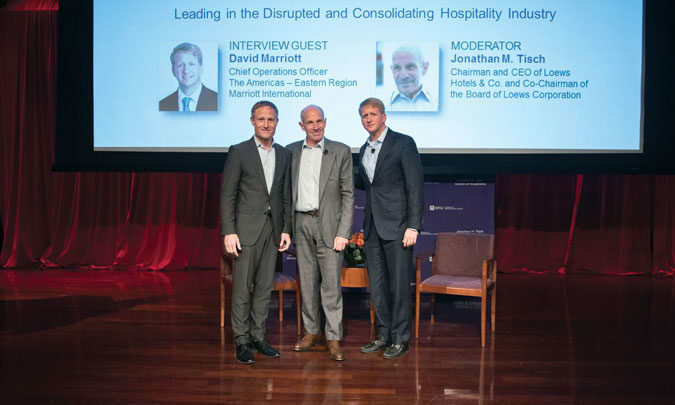 Along with moderator Jonathan M. Tisch, chairman/CEO of Loews Hotels & Co. and co-chairman of the board of Loews Corp., this year’s speaker was David Marriott, COO, the Americas – Eastern region, for Marriott International Inc. Responsible for more than 2,000 hotels across 23 states since Marriott acquired Starwood Hotels & Resorts Worldwide, Marriott was able to speak to the night’s theme—leading in a transforming environment—while grounding the subject matter within the context of the industry’s past—namely, the company culture his grandparents, J. Willard Marriott and Alice Sheets Marriott, and father, J.W. “Bill” Marriott Jr., created. 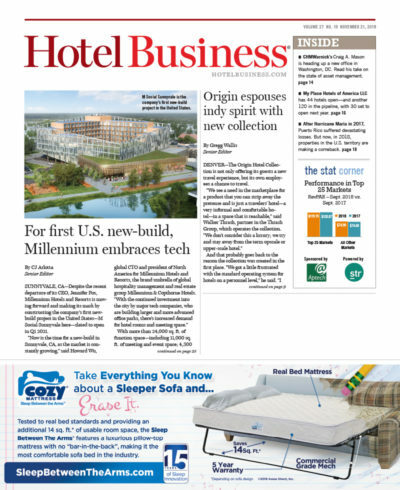 Recognizing that the business is more complex today than it was 50 years ago, Marriott said that the company’s philosophy has nevertheless remained the same. “The formula for success hasn’t changed. It’s about inspiring and motivating your people,” he said. Marriott also noted that the company’s culture has helped it weather other transformational changes as well—such as a workforce that’s interested in a better work/life balance. “One example of that: Over the last several years, our event management staff had been particularly under a lot of stress,” he said, noting that many would go 10-12 days without a day off. “We ran a pilot in the Carolinas—an alternative work arrangement. We provided them with the flexibility to work from home when they didn’t have a group in-house to give them the opportunity to get out of the hotel and have more balance. It was a huge homerun and we rolled it out across the region.